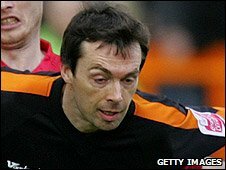 Barnet defender Gary Breen has signed a new deal with the club to become assistant manager in combination with his playing duties. The 35-year-old joined Barnet in December and made 22 appearances for the League Two side last season. The ex-Republic of Ireland man told the club's website: "Assistant manager is another step in the direction of my ultimate aim to manage a club. "It is my priority but I will play on as long as it benefits the team." The centre-back has played 603 club games in an impressive career, including spells at Maidstone, Gillingham, Peterborough, Birmingham, Coventry, West Ham, Sunderland and Wolves. As a player, Breen was linked to Inter Milan. How far can Breen the coach go? He won 63 caps for the Republic of Ireland and scored in the 2002 World Cup. Bees manager Ian Hendon said: "He looked different class as a player when he came in last season. I am looking forward to working more closely with him."